Do you find yourself in Ghent looking for a swimming pool to do a couple of lanes? Wondering which pool is just on your way to work to get energized first thing or relax after a hard day at the office? Do some pools offer bubble baths or a sauna to soothe your legs afterwards, and how much will I have to pay? 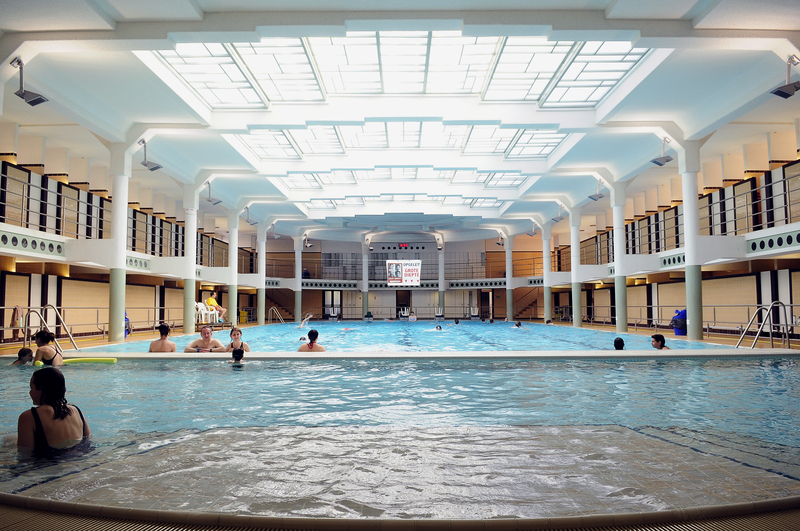 All these questions are answered in our guide to the 5 best Ghent indoor swimming pools. Located next to the Watersportbaan GUSB is the students’ favourite. At 2.20 euros it offers the lowest entrance price for Ghent University students. The pool has a 25m lane and is located next to the other student facilities. You may consider combining a swim with a workout or climbing session beforehand, and a sauna afterwards. For non-students this is the most expensive option (6.50 Euro) of all the swimming pools in Ghent. The Strop swimming pool is my personal favourite in the morning. Through the south-east-facing glass front alongside the 25m lane you can experience the break of dawn – perfect for motivation. The pool is a bit hidden in the Strop district and usually less crowded than GUSB, Van Eyck or Lago Gent Rozebroeken. Make sure you check the opening hours since they vary extremely during the week. After your exercise the bubble bath is a nice way to properly relax. Named after the Ghent painter Jan Van Eyck this pool is also the oldest in Belgium and opened as a public pool in 1886. Its history shows in the well-preserved Art Deco interior and glass roof. The historic surroundings together with “Radio Nostalgie” over the speakers takes you out of your daily routine. The 25m lanes are usually quite crowded and it is worthwhile going later in the evening (it’s open until 10pm) to avoid traffic jams in the pool. A note from experience, any public holiday or strike in Belgium will also lead to closed doors, especially at Van Eyck. Rooigem is another indoor swimming pool located east of the centre. It has 25m swimming lanes and some small facilities for kids to play as well as a bubble bath to relax after exercising. Like in all public pools (Rooigem, Strop, Van Eyck) the basic entrance fee is 6 Euro. If you can prove Ghent residency, or that you’re under 26 or over 65, the entrance price is reduced to 3.30 Euro. The Lago Gent Rozebroeken is definitely the most sporty and only facility with 50m swimming lanes in Ghent. At the same time it has a large recreational area for rainy Sunday family visits. But this is not included in the entrance price for the swimming lanes (3 Euro with Ghent residency and 6 Euro without). It is also the most remote swimming pool in Gent, located at the outer edge of Sint Amandsberg. Either you take a warm up cycle ride to arrive there or drop your car at the parking facilities in front of the pool. Competition swimming can be done here as well. To sum up, there are 5 indoor swimming pools in Gent, nicely spread over the city and with a variety of lane lengths and simple pricing. Below you can find our comparison of the 5 indoor pools. Enjoy your swim! And in the summer months why not replace some indoor swimming with outdoor exercise at the Blaarmeersen lake. Max is a PhD student in Coastal Engineering at Ghent University. Originally from Germany, he’s also lived in the Netherlands, Norway and USA before coming to Belgium. He enjoys sport as a way to shut down from the computer and relax, and recently discovered photography as a new hobby. Curious about other cultures, he also enjoys trying different types of food and hearing about other people’s stories. He has been living in Ghent for 3 years and loves the city’s variety of cultural events and comfortable lifestyle. Where can I find good swim teacher for adults? Swim lessons are organised by the “Sportsdienst” of the city of Ghent or privately by Aqua and move in the Lago Gent Rozebroeken. Unfortunately both websites are in Dutch only but it might be worthwhile to use the phone details provided and give them a call for detailed information. Hope this helps! We just mentioned a swimming school for adults in our workshop article. See sport section.